Visiting Xconomy.com on a smartphone should be like flying first class in the Pan Am heyday: a chance to listen in on the conversations of some of the day’s biggest movers and shakers in state-of-the-art surroundings with the minimum of aggravation or delay. That’s why we’re excited to announce the arrival of a dramatically upgraded version of the Xconomy website for mobile phones. Starting today, if you’re browsing Xconomy from an Android phone, an iPhone, a Windows phone, a BlackBerry device, or any other touch-driven smartphone, you’ll see a completely overhauled version of our mobile site. It uses the latest design concepts and software tools to help you find, read, and share our newest stories quickly and conveniently. As with any good design, the new site is pretty self-explanatory. But we can’t help gabbing about a couple of the coolest features. One is a slide show on the app’s home page that cycles through our five top stories of the moment, with a big cover image behind each headline. You can flick through the slides manually if you want, and you can click on any slide to jump directly to the story. The new Xconomy mobile site menu, which can be toggled on and off by tapping the button at upper right. Another nice feature is the new menu button in the upper right corner, which gives you quick access to the whole mobile site, including our city pages, tech channels, and event listings. Tap the menu button once to make the full navigation menu appear; tap it again to make it go away. Articles look great on the new mobile site, with big art and clean, readable copy. There’s also a full array of sharing options (Google+, Twitter, LinkedIn, Facebook, and Hacker News) plus a slick mobile version of the Disqus commenting tool. Your pilot on this journey is Rob Hunter of New York-based True Italic. He’s the same design ace who built the current desktop version of the site, which we rolled out in December 2011. Rob says one of the big challenges designers face when optimizing content for mobile devices is estimating how far to jump: that is, how many of the hottest new techniques to incorporate into the design, while still respecting a decade’s hard-won wisdom about simplicity and usability on the desktop Web. We think the new site does all that—but it’s definitely a work in progress, so we hope you’ll send your feedback to editors@xconomy.com. We’ve had a blast working with Rob and doing everything we can to make the site easy to look at and easy to navigate. 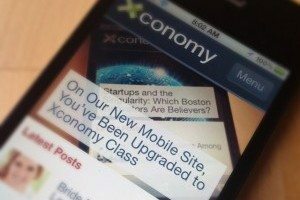 We know you have a choice of tech blogs, both on the desktop Web and on your mobile devices—so thanks for flying Xconomy!